Leonardo Flores is a Professor of English at the University of Puerto Rico: Mayagüez Campus and the Treasurer for the Electronic Literature Organization. He was the 2012-2013 Fulbright Scholar in Digital Culture at the University of Bergen. His research areas are electronic literature, poetry, and preservation of first generation electronic objects. He is the lead writer, publisher, and editor of a scholarly blogging project titled I ♥ E-Poetry (http://iloveepoetry.com). For more information on his current work, visit http://leonardoflores.net. Welcome to my Twitter Bot Workshop! Here’s a link to a Google document for the workshop. You will also need a phone number for your account that isn’t tied to any other Twitter account. And if you can’t do it, no worries! Those who don’t have an individual bot project to develop will work collectively to create a bot in the workshop. Here’s a link to our worksheet. 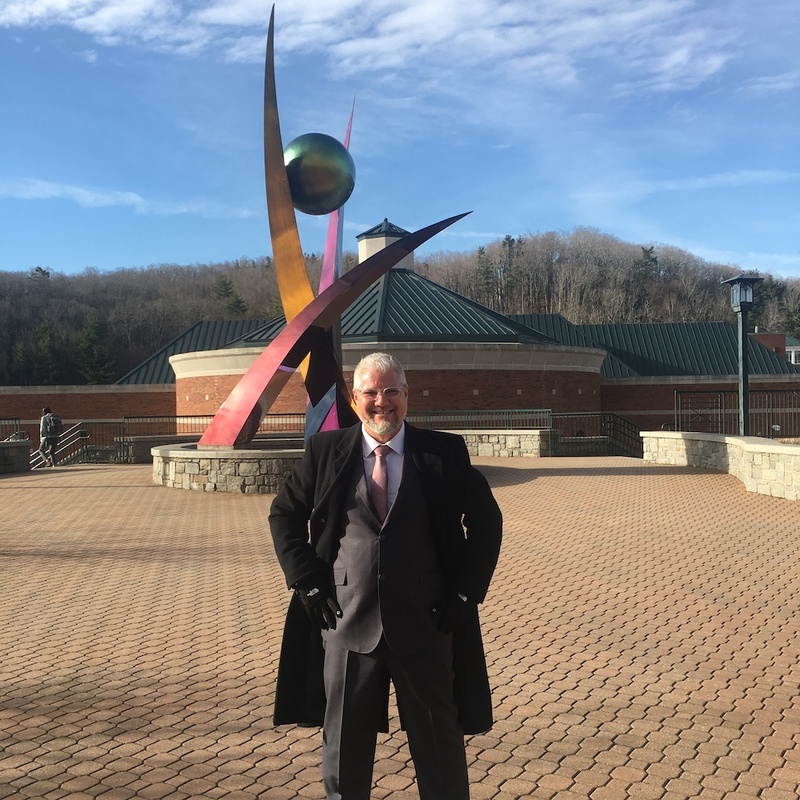 I am pleased to announce that I have accepted a position as Chairperson and Professor in the Department of English at Appalachian State University in North Carolina, starting on July 1, 2019. This marks the end of a fruitful career at the University of Puerto Rico: Mayagüez Campus. Here are a few milestones from my journey that began over 30 years ago. 1988-1992 – My undergraduate studies at UPRM, during which I served as EDSA president and Student Representative for 2 years and earned the Mellowes Award. 1992-1994 – I received a UPR Presidential Scholarship for my MA studies at Bowling Green State University. 1994-1999 – I joined the English Department as an instructor, at the end of which I was granted a promotion to Assistant Professor, Tenure, and a Study Leave. 1999-2003 – I studied at University of Maryland, supported by UPRM with a Study Leave with Financial Aid. 2003-2008 – I returned and served as an Assistant Professor, and was promoted to Associate Professor. 2008-2012 – I served the College of Arts & Sciences as Associate Dean of Assessment and Educational Technologies. 2012-2013 – I became a Fulbright Scholar in Digital Culture at the University of Bergen, receiving 25% sabbatical support from UPRM. 2013-2017 – I returned to UPRM and received seed money and research release time to develop I ❤️ E-Poetry, the Electronic Literature Collection, Volume 3, and other publications, and was promoted to Full Professor. 2017-2019 – I have served the English Department as Interim Director. I owe an incalculable debt of gratitude to my alma mater which has contributed to my academic and professional formation. And that includes the faculty that taught and mentored me, my colleagues and friends who I’ve collaborated with, administrators who saw my potential and invested in me and my projects, and last (but not least) my students, who have taught me more than I could possibly teach them. My Curriculum Vitae and other accomplishments have been built upon this institutional context. I also owe it all to my dear family. My parents gave me the gift of a stable loving childhood, an excellent education, and modeled professionalism. My brother and sister (and cousins, aunts, uncles, nieces and nephews! ), all of whom have been inspirations as they have succeeded in other career paths. My North Carolina family has been so loving, and helpful, and supporting all along the way since Kara and I joined paths. My children Olivia and Blake have allowed me to look at electronic literature and digital media through fresh eyes, seeing its importance, potential, and areas for future development. And my dear wife Kara, who has given so much of herself to build a life and family with me, has been foundational to my academic, professional, and personal success in more ways that I can say. I quite literally owe this success to her. No really. Even before becoming a Proposal Development Specialist at UPRM, Kara has been the secret weapon behind every successful proposal I have ever written. It was she who took one look at my cover letter for Appalachian State (which I had unsuccessfully applied for the year before, not even getting an interview) and noted that my approach was flawed. I was presenting myself as a scholar, not as someone with the leadership skills needed to direct their English Department. And so, I rewrote my letter from the ground up, leading to this moment. If you’re curious or interested in the story of my development as a leader, here’s a copy of my letter. I’m also grateful for my scholarly community. We who are fascinated by what happens to literature when created in conversation with electronic and digital media are many, but we are spread thin around the world. So when we come together in our conferences, festivals, and social media spaces we celebrate and help build our field, our scholarship, and our craft. Beyond these moments, we support each other through collaboration, peer review, sharing ideas and resources, invitations, writing letters of support, and being references for each other. We grow strong together. Two institutions in the field have helped shape me as a scholar. The Digital Culture program at the University of Bergen is a special place that I joined as a Fulbright Scholar in 2012-2013. They were instrumental in helping me launch my research and have honored me with invitations to join them for dissertation defenses, public lectures, and other scholarly activities. The Electronic Literature Organization has also been a nurturing space for my scholarship, and I am honored that its Board of Directors has increasingly entrusted me with projects and leadership roles within the organization. Finally, I want to thank the peers I will be joining at Appalachian State University, particularly the members of the Search Committee, the faculty and staff of the English Department, and the Dean of Arts and Sciences. You have made this a very constructive and welcoming process, and I am honored by the trust you have placed in me. I’m looking forward to joining you this coming academic year and getting to know you all through collaboration and fellowship. This Spring 2018 semester I will be offering 3 courses: Modern Poetry, Digital Creative Writing, and Digital Humanities Internship. I have linked to the course blogs, with which I have offered at least two or more iterations of the courses, which should allow you to have a sense of what I’ve covered in the past. For a more immediate synopsis, take a look at the flyer below. Modern poetry is the second in a 3-part series of poetry courses he will be offering. You can jump in anytime, but if you take all three you will have mad poetry analytical skills and knowledge of the past 100+ years in poetic tradition. Digital Creative Writing (same course number as Creative Writing) and Digital Humanities Internship both can be used for the Innovation Tracks in Digital Media certificate. I am pleased to announce that from July 10-23 I will be visting Porto in a series of scholarly activities and public appearances sponsored by the Fulbright Specialist Program, the Fulbright Commission in Lisbon, and Universidade Fernando Pessoa (UFP). July 13-14: Available for meetings and consultations 9:00 – 12:00, 13:00 – 16:00 UFP CETIC. July 14: Presentation: “Electronic Literature and the Future of Writing” 18:00 – Salao Nobre at UFP. July 18: Meeting: litElat: Latin American E-Literature Network 16:00 – 18:00 at Sala Fernando Pessoa, EEPG. July 19: Panel Presentation: “Mainstreaming Electronic Literature” 10:30 – 12:15at UFP Auditório. July 21: Roundtable Presentation: “Translations and Renderings” 10:30 – 12:15 at UFP Auditório. If you are interested in meeting with me in the Porto area, don’t hesitate to contact me via e-mail so we can schedule an appointment, especially on July 13-14. If you’re interested in knowing more about electronic literature, you can watch my TEDx talk on YouTube or attend the Electronic Literature Organization 2017 Conference and Festival (see poster below), with scholarly presentations, exhibitions, and performances at UFP and around Porto. And special thanks to Dr. Rui Torres for this generous invitation! This semester has presented me with opportunities to create several critical memes. From teaching how to create memes that present complex ideas and critiques in my Digital Media Criticism course to a fiscal crisis in Puerto Rico that has led to an indefinite student strike at the University of Puerto Rico, I have had plenty of inspiration to explore this popular digital media genre. So here are some of my most recent memes. My most recent one is inspired by this meme about Republicans planning to repeal of the Affordable Care Act. Here’s a link to the GIF version. This series was inspired by Puerto Rico’s National Strike on May 1, 2017– a massive peaceful protest against austerity measures that was misrepresented by the media and many people when a small group of people engaged in vandalism after the event had concluded. Finally, when Governor Ricky Rosselló, who repeatedly stated during his campaign that the debt could be paid and that he wouldn’t declare bancruptcy, declared bankruptcy, I created these two memes (click to enlarge). Translation: “Story of a Retraction” Summary: each panel from a featured image in El Nuevo Día newspaper depicts his or his staff’s statements about bancruptcy in complete turnaround. I don’t know how much of an impact these memes will have, but they’re fun to create and circulate nicely in social media. My most successful one has received of 4,500 shares between Facebook and Twitter since it was launched a week ago. Most importantly, they allow me to express my perspective on current events while I practice my skills on and learn about what makes this such a popular digital genre. Please support this publication with your vote here. Voting is open until Friday, February 25. Digital Humanities Awards are a set of entirely open annual awards run as a DH awareness raising activity. The awards are nominated and voted for entirely by the public. These awards are intended to help put interesting DH resources in the spotlight and engage DH users (and general public) in the work of the community. 1st runner up in “Best DH project for public audiences” 2013 Digital Humanities Award. 1st runner up in “Best Blog, Article or DH Publication” 2012 DH Awards.